My favorite form of art is film. I probably experience film/movies about twice a week is. My favorite actress at the moment is Jennifer Lawrence who is most famously known for her role in the Hunger Games movies and starring in Silver Linings Playbook for which she won Best Actress. then joked about it in the post award show interview. She is constantly talking about eating cheese burgers and how lucky and blessed she is to be in a situation where she can influence people. My favorite quote by Lawrence is posted on the picture to the left. I really relate with it, not because I’ve had an eating disorder but because all of the people in the media and fashion world are the size of my pinky and it’s really disappointing to “normal” looking girls like me. I've grown up athletic and I’ve been a curvy and muscular girl practically since I was born. The above link is the official bio of Lawrence. It gives her life story and a detailed outline of her life, her resume and all small roles she played while she was an up-and-coming actress. The above link in from the media/tabloid/gossip magazine “People.” This is an archive of everything that Lawrence has been a part of in the media. You’ll find articles about what/whom she’s wearing, what she’s doing, trips and movies she’s been a part of. This is the ultimate Lawrence fan page. All random facts that any fan or any person who wants to learn about Lawrence will be found at this website as it’s full of videos, interviews, pictures, updates and facts. I find Bob Marley to be a compelling artist who is especially worth sharing not only because of his musical genius, but because of the profound impact he has had on the world, both during his time and after his death. Marley was the world's first artist to become popular out of a third world country and the first artist to bring reggae into the spotlight of popular music. Not only did his music top the charts, but it was also laden with social and political themes. He promoted peace and tolerance, while advocating for justice and equality. His music is compelling both musically, thematically and lyrically. I would argue that Bob Marley is one of the world's most influential musical artists of all time. 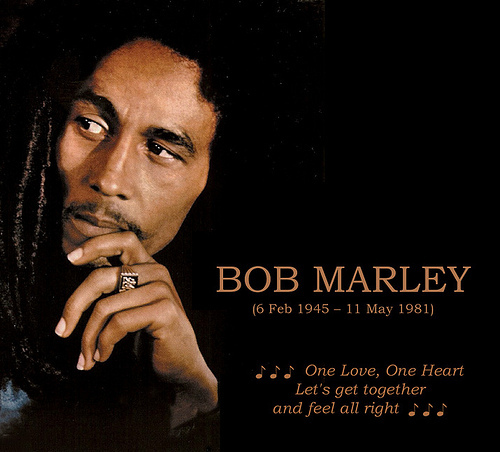 BobMarley.com is the official website of Bob Marley. It features biographical information pertaining to both his professional and personal life, video clips of his music, photos of him with family and friends, news regarding the Marley legacy and a shop to purchase music and merchandise. The site also contains information about the several Marley family charities. From someone who knows little about Bob Marley to an already avid listener of his music, this site has what anyone would need to know about Bob Marley. The twitter feed for Bob Marley contains up-to-date information about how Marley's music continues to influence the world today. 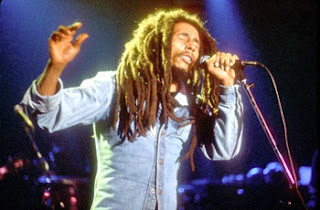 The feed also contains information about Marley's children, almost all of whom have successful music careers themselves. The Bob Marley twitter feed is also a fun place to go for those interested in getting to know the personality behind the artist, as famous Bob Marley quotes are often tweeted from the feed. The New York Times' "Times Topics" archives for Bob Marley contains almost all newsworthy information regarding Bob Marley, his family and his fans. The site gives a brief biography of Marley and contains archives to any article written by the New York Times regarding the artist. It also features a timeline of events central to Bob Marley's life. I chose to do Neil Patrick Harris because of his phenomenal attitude both behind the camera and offstage. He was born in 1973 and grew up in the New Mexico area and acted in many of his High School plays and musical and graduated with honors. His acting has won him many awards, from the Young Acting Award to the People's Choice Award (and a few Emmy's as well). His acting career is truly astonishing, starting out as a child actor in movies all the way to lead roles in multi-season popular television productions. Not only that, but he has also performed on Broadway in both dramatic and musical roles. As a comedian he routinely entertains the audience. One of his most notable appearances is the character Barney in the television series "How I Met Your Mother" where he plays a very important antagonistic role. --On this sight you can find NPH's current projects as well as what he has done previously. You can also watch a video on an interview with him. --This site is a great site for any true Neil Patrick Harris fan. You can get a detailed description of what hes doing as soon as the public is notified. Also there are links to videos and his social media sites. --This is another fan site for Neil Patrick Harris. Although not as well put together as the first one it still has interesting information on it. Here you can find his current projects, visit the picture gallery, or watch some of his short video clips. This site is created merely by fans and is no way affiliated to him. When it comes to artists, they are accepted by some and rejected by others. Nicolas Cage has seen both critical praise and criticism for his works throughout the years. I have chosen to represent Nicolas Cage because of how he is represented in our media culture today. I'm sure anyone reading this can think of at least one Nicolas Cage movie that they have enjoyed, maybe even in your list of top favorites. On the other hand, you can probably name more than one where he was ridiculous or too intense. The broad spectrum of roles portrayed by this actor is astonishing. 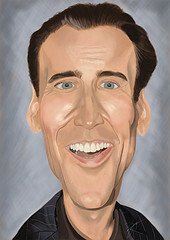 Nicolas Cage has engaged the audience as a family man, crazed psychopath, dedicated officer, and anything in between. His particular style of acting is of his own design called "Nouveau Shamanic", and I believe that is why we have not seen anyone like him on screen before his time, and to date. Trần Thị Hoàng Lan or Ý Lan, who was recorded in the Guinness book as a person who collected the most colors of natural sand in Vietnam. She now has more than 80 natural colors of sand. Ý Lan uses sand to do sand painting. Her paintings are stunning, and she is called “The beautiful lady infusing a soul into the sand” or “The lady playing with sand”. There are some special features about her and her handicrafts. First, she has never attended to any art school. With her skill, she only needs a coffee spoon to pour different natural sands into different types of glass containers, creating many different pictures. For example, landscapes, calligraphy works, logos, religious themes, person portrayed the liveliness of the portrait and so on. Because using the natural color sand and not contain any agglutination her sand painting will last for a supper long time. Ý Lan’s sand painting is considered as a unique art, and has been famous among Vietnamese people and oversea people. She has gained so many titles and certificates. This is her own website, which contains more information about her and her art. Electric Dance Music, commonly known as EDM, has become an increasingly popular genre of music of today's young generation. 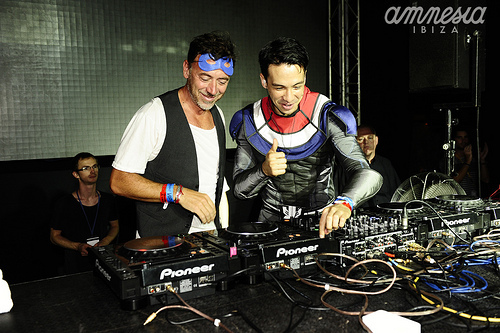 EDM can be described as a socially, feel-good, heavy bass and drop, dance type of music. It's the type of music that has the ability to make you unconsciously start bopping your head to the beat. 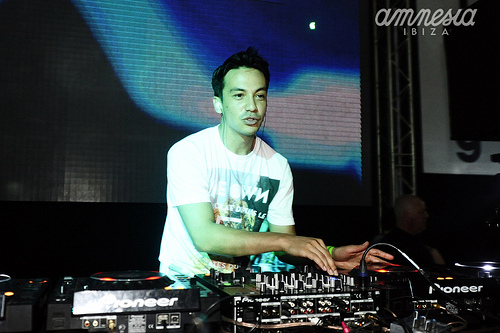 Laidback Luke's music sets, collaborations, and remixes are far from being 'laidback'. 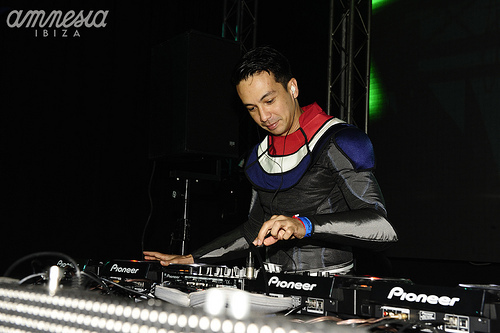 He is referred to as a 'Dutch heavy weight house master', presenting a unique style of house/dance music. He's made his name known all over the world where his Super You&Me events sell out wherever they're held. I first got the opportunity to watch him perform live this past Fall at USC's event Freaknight, an event where a collection of popular, well-known, or upcoming DJ artists perform and showcase their musical beats. 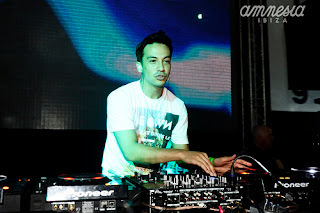 As an amateur to EDM, this event was a great way to open my ears up to a multitude of EDM artists and Laidback Luke was definitely one that stood out. What I enjoy most about his style is his combination of electronic/dance/house with hip-hop/rap because it caters to my personal taste and liking of both genres. One source describes his style as being, "hyper-drive-house-step and ghetto-jack-trance-bass," which I think describes it perfectly. He's able to take a variety of musical genres of old and current popular, well-known songs and create a set that's definitely worth listening to! Intrigued? Curious? CHECK OUT THESE LINKS! Geoarges Seurat was a 19th century painter who developed the technique of pointillism. I find this style of painting very intriguing due to the immense amont of work involved and the effect the picture has on the viewer based on the distance that they are viewing the painting at. Not only is the style of painting very distict but I find the subject matter very intrigueing as well. Mant of Geoarges paintings are of are subtle images of life in the in the current state. 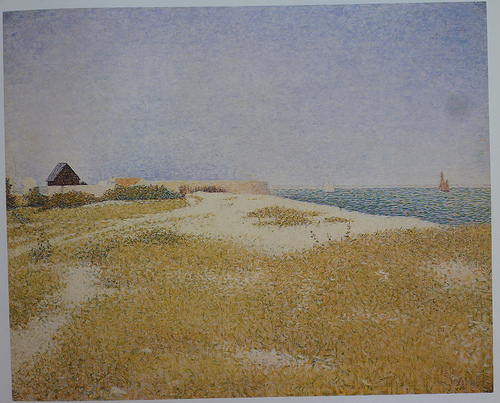 Of his more famous painting, Sunday Morngning, as shown above is just trying to portray a day in the life at a typical beach in France. The scene itself is nothing in particular but it captures a moment of serenity where no photographs are available. 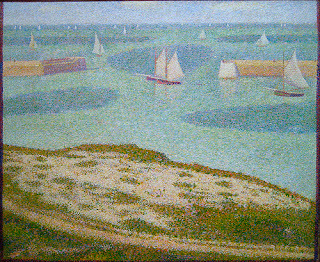 Another painting, Entrance into the Harbor (shown below) is another great example of pointillism. I love the colors that are used and the calm feeling the the painting gives across. 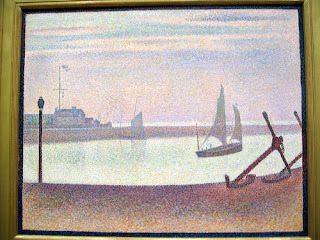 Geoarges Seurat is also known for starting a neo-impressionist school in France. Not only was he an amazingly detailed painter but a teacher as well. 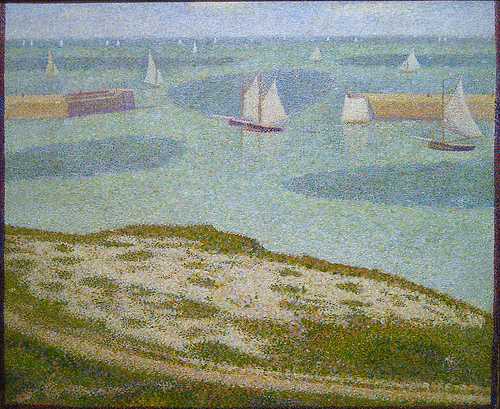 This website is a must for anyone wanting know get a brief description of Geoarges Seurat along with an online museum of all of his works. This is a website completly dedicated to Mr. Geoarges and only Geoarges (as the url implies). There are 240 of his paintings published on this website. 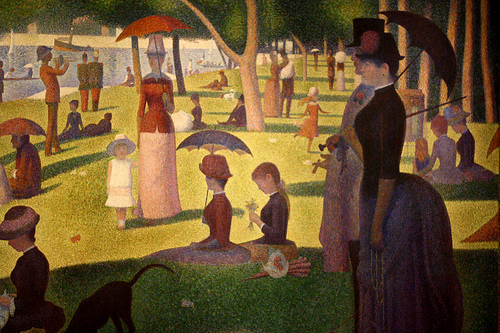 This is a website published by Princeton University with detailed accounts of Geoarges Pierre Seurat's life (where he is from, hobbies, painting styles, older age). Very informative!